I've now been infected with Cellulitis-like infections twice in 6 months. Apart from washing the gear in disinfectant/antibacterial soap (which one?) what else is available to prevent this reoccurring? Anyone tried taking Doxycycline as a prophylactic measure? I have some dry kayaking trousers but I'm not keen on wearing them in hot weather. History: In June 2018 I was standing in shallow water at Rock in Cornwall while trying to start an outboard (as you do) while wearing a wet-suit and hiking boots - after I gave up with the outboard I went for a sail. Later that evening I noticed a slight rash on my ankle and woke the next day feeling feverish and with a pounding headache and a swelling in my groin and a larger rash. In fact (as I later discovered thanks to Dr. Google) the likely cause was a bacteria called Vibiro Vulnificus which is associated with Oysters (there is an Oyster Farm nearby and they are treated at the farmhouse with runoff water into the bay) but the doctor in Cornwall misdiagnosed it as a migraine (which I get occasionally) and possible DVT (I had flown from from Australia a week prior) and gave me pain killers. You can get it from a cut in the skin and I had a tiny splinter in my foot. So the following day, after taking the pain killers and a self-diagnosed antibiotic, I drove up from Cornwall to London in Friday traffic, in a manual black car, on a hot day, feeling feverish with a blinding headache in a horrendous traffic jam caused by an Ed Sheeran concert at Bristol (hated him before - really hate him now!). Eight hours driving for a what would normally take 5 hours. I wasn’t until I went to St. Mary’s Paddington the next day that I was diagnosed and treated for Cellulitis and, after trying oral antibiotics without effect, while the Bullae developed on the back of my leg. Finally, I was put on different IV+oral antibiotics for a week which reduced the affected area to 25% but the skin broke on the back of my leg and it was like being flayed alive when I walked and it took a month to fully recover. The swelling in the groin was from the Lymph node which was about the size of a golf ball. It wasn't until I returned to Oz that I searched for "Oyster Skin Infection" (why you may ask ) and was able to join the dots and identify the cause (they tried to take a culture in London but only after the antibiotics). Now, after helping lay marks for the Mirror Worlds in a wet boat in Sydney, I've had another Cellulitis infection which I was able to recover from faster as I recognised the symptoms and went to my doctor immediately and then to hospital to get the IV anti-Bs and Doxycycline which is the required oral antibiotic. They tried and failed to get a culture but I had already been on the antibiotics for 12hrs by then) but it was more like classic Cellulitis rather than Vibrio this time. Vibrio Vulnificus lives in warm brackish water and is associated with oysters. 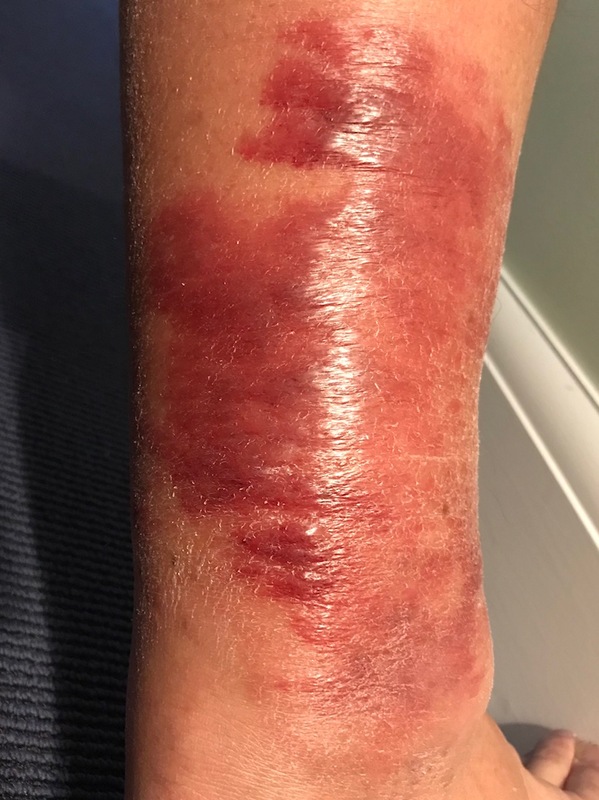 Vibrio vulnificus infection is the leading cause of death related to seafood consumption in the United States [but it has also been found in the UK]. This virulent, gram-negative bacterium causes two distinct syndromes. The first is an overwhelming primary septicemia caused by consuming raw or undercooked seafood, particularly raw oysters. The second is a necrotizing wound infection acquired when an open wound is exposed to warm seawater with high concentrations of V. vulnificus. Most patients, including those with primary infection, develop sepsis and severe cellulitis with rapid development to ecchymoses and bullae. In severe cases, necrotizing fasciitis can develop. Case-fatality rates are greater than 50 percent for primary septicemia and about 15 percent for wound infections. I did report my Cornwall infection to the local doctors, the dept of the Environment and corresponded with the expert who is tracking such infections for the DoE in Cornwall. He couldn't confirm if it was V. Vulnificus because there was no immediate culture sample taken but suggested the symptoms seemed suspicious and they've been isolating vibrios from several sentinel sites along the south coast of the UK all summer, but there is an apparent lack of clinical cases (from water and from shellfish) yet - you have been warned! Christ thanks for the heads up! Hope its under control now. Is it Shellfish sensitive people or anyone ? I have been to the area mentioned about half a dozen times last year with no ill effects, Kayaking and Surfing. Kayaking (wearing a wetsuit) you are getting up to knees wet and sitting in Kayak baking in the sun. Surfing, (wetsuit) and wet all day. It’s anyone - although you are likely to have a more severe reaction if you have a compromised immune system and if you eat an infected oyster instead of being infected though a wound. You cannot tell if an oyster is infected by looking at it. I’ve been going to Rock for over 50 years and doing all the things you mention both with and without a wetsuit (well I was young and foolish back then). I have a house at Porthilly and there’s been an oyster farm at the entry to the bay for 10 years. However, now they process and clean the oysters at the farmhouse with the runoff water going into the bay. Plus there’s a freshwater stream and Porthilly is very shallow so the water is warmed as the tide comes in - all the ingredients Vibrio needs, I’d suggest. I now use Milton tablets to disinfect my Dinghy boots and warm soapy water on the wetsuit and dry out after every use. I use Dettol, glad you highlighted this. I wouldn't assume that a wetsuit reduces the risk. In a wetsuit you are trapping whatever is in the water against the skin in a nice warm (hopefully) environment for several hours. And the liner may rub the skin exposing any microscopic weak points. Yes I agree about the wetsuit Vs dry suit issue. In fact I borrowed s dry suit to sail in a Weta in Rock in June which was great when it’s windy but overall I prefer a wetsuit. Now I’m back in Sydney, I have to decide what to wear this weekend when it’s going to be a sunny 28 Deg and 15 knots of breeze. Skiff suit, wetsuit shorts or dry kayak trousers? Perhaps drop a line to Surfers Against Sewage they would be all over this.